All it takes is a game like the one Noah Syndergaard had over the weekend — five runs in four innings despite six strikeouts against two walks — to be reminded that even a Norse God has to maintain his game by refining it. 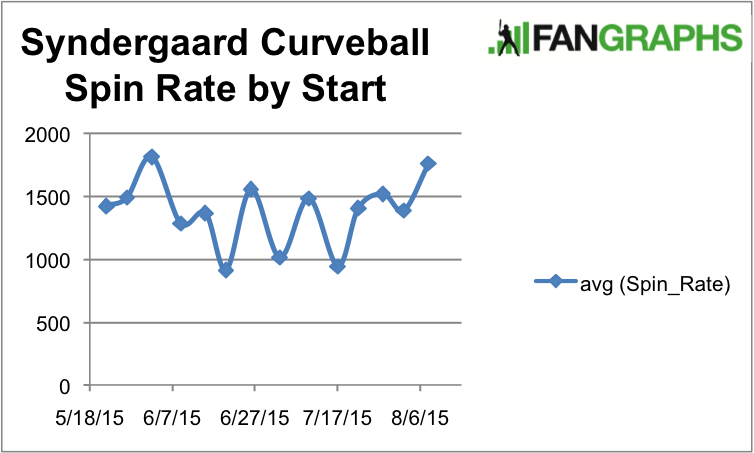 Though Syndergaard’s curve is already a top-ten hammer by whiffs, he’s been working on it. And he might be adding a new baby weapon to go along with it. 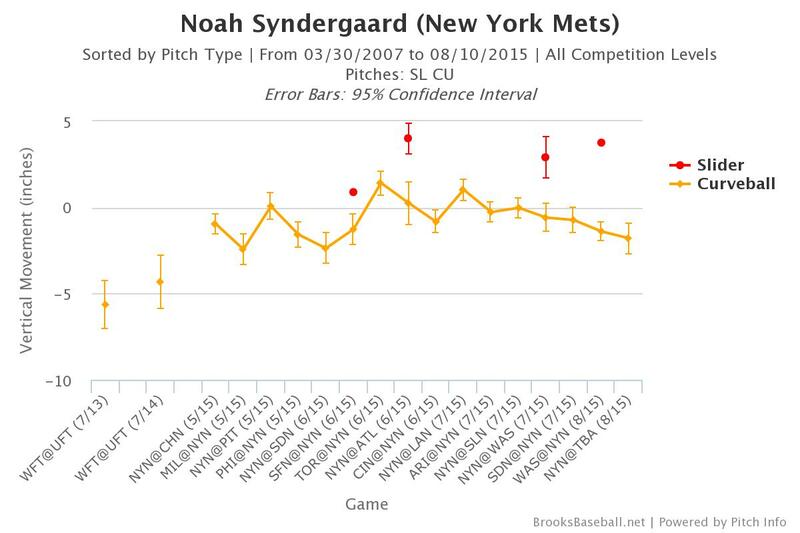 When I first talked to Syndergaard, he was in the Futures Game telling me he thought that the difficult confines of Las Vegas had helped him improve his changeup by making his curveball less effective. Though his cambio goes 88 mph on average, it still has an above-average velocity gap when compared to his 96 mph fastball. Paired with two inches of extra fade than average, it’s not surprising that the pitch has gotten more whiffs (15%) than the average change (13%). But it’s the breaking ball that has the nickname, and rightfully so. Only the curveballs thrown by Jose Fernandez, Trevor Bauer, Clayton Kershaw, Yordano Ventura, and Cole Hamels have been thrown anywhere near as often (200 minimum) and had a better whiff rate than Syndergaard’s 18%. The tall Met has actually thrown it 386 times so far this year, and if you move the minimum up to 300, only Ventura and Kershaw beat him. So the last time I talked to Syndergaard, in early July, I had to ask about something I’d noticed in his curveball velocity. It was getting harder — which is good for whiffs. What the key to improving the velocity? “Just trusting the grip again and throwing it consistently,” he said of the curve. 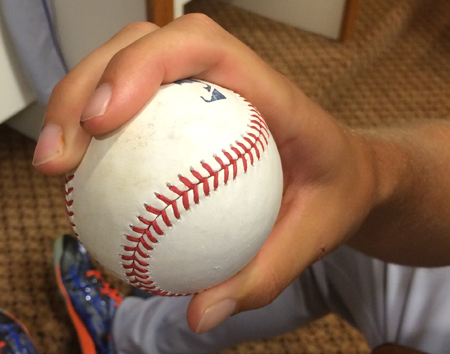 The grip that brings Thor’s hammer. It’s a conventional grip, but he throws it so hard. On the season, his 82 mph average on the curve places him behind starters Carlos Martinez, Matt Harvey, Ventura, Fernandez and Corey Kluber (if it’s a curve) on the velocity leaders. It could be all arm strength — we know he’s a strong guy. But that velocity increase that we saw in July? It doesn’t seem to have stuck. Ever since he faced the Giants in mid July, Syndergaard’s curve has returned to the 81 mph place from whence it was spawned. Maybe one of his other comments — and pitches — can give us a clue about what’s going on there. Since I was looking into the fact that the Mets throw low-spin, high-velocity sliders as a group — a slider we could name after their pitching coach, Dan Warthen — I asked Syndergaard if he was learning a Warthen slider. “Played with it a little just to pick up the rpms on the curveball,” he said at the time. That was weird because his spin rate on the curveball was in decline at that point. Let’s check back in on the spin rate — in this case, calculated by PITCHf/x, not observed. You’d think that the higher-velocity curves would have had more spin. Velocity is positively correlated with spin rate, but it only predicts about 8% in the variance in spin rate. So there are other, bigger factors here. Maybe mechanical ones. Since spin rate is calculated in this system, maybe it’s not surprising that vertical drop is well correlated with spin rate — the r-squared is over .22, meaning that spin rate alone predicts about a fifth in the variance in the drop on a pitch. So if you look at the vertical movement on the curve, you’ll see that when his spin rate was dropping, mid-season, he showed his worst drop numbers. So maybe what the pitcher was faced with was a choice on his breaking ball. We know that curveball drop and velocity are both good for whiffs, and maybe he found that the harder he threw his curve, the less it dropped. That makes sense anecdotally — most pitchers with whom I’ve spoken have expressed this belief to me, at least — and also scientifically. More velocity means less time in the air and less opportunity to move. The numbers aren’t as stark — they are related (p less than .0001) but velocity only describes 4% of the variance in vertical movement. In the graphs above, maybe you’ve noticed a few slider blips mixed in with the curveballs. Even though Syndergaard told me he wasn’t throwing the slider regularly, he did show me the grip, and he has been throwing some sliders this year: 21 of them spread over four starts, to be exact. Looks like a Warthen Slider — it’s all in the fingers. He’s gotten five whiffs on this new pitch, which — like the other Warthen sliders before — has tons of gas (88 mph) and not a ton of movement. 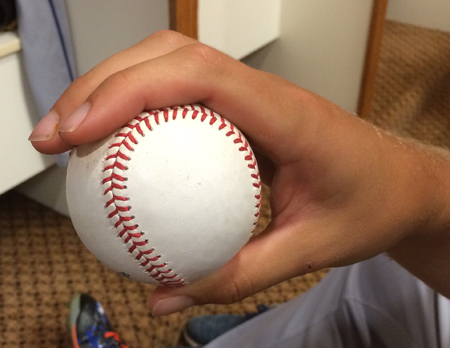 Despite having two inches less drop than your average slider, it looks like it could help Syndergaard. Having it would give him two pitches in the high eighties, and put less pressure on the pitcher to throw his curveball fast. Let’s try to connect the dots here. We have the pitcher admitting that throwing the slider affects his curveball spin rate. We have him introducing that slider, and the curveball spin rate changing. But then we can see him re-finding his classic curveball movement and velocity most recently. 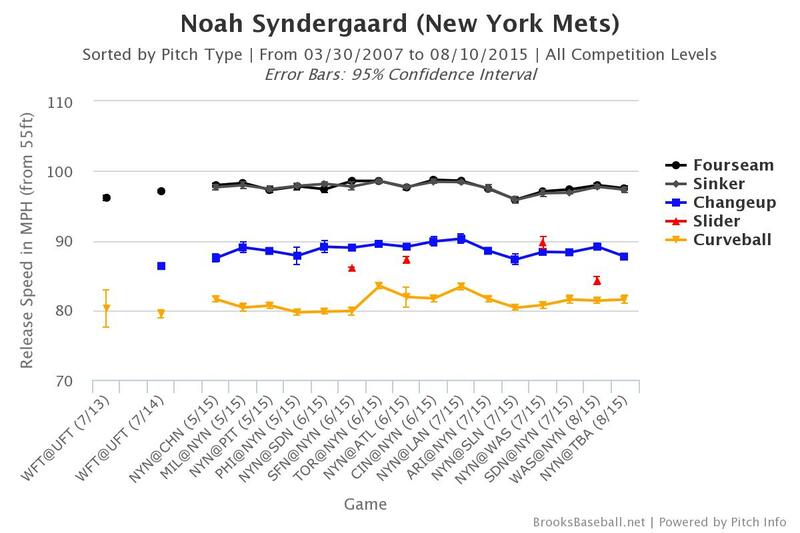 In the start before the last bad one, in which he faced the Nationals on the road, Syndergaard threw two sliders. That was one of the four times this year he’s thrown the slider in game since he started using it in late June. But the curve was impressive again, too. It showed a 1390 rpm spin rate, an 81.5 mph average, his third-best single-game drop (-2.4) of the year, and his second-best single-game whiff rate (26.7%) of the year. As we finished up talking in early July, I pressed Noah Syndergaard on the slider. Would he throw one? “As of now, I’m just a fastball / curveball / changeup guy. For the future?” he shrugged. That’s probably because you never know exactly what a new pitch will do to your arsenal. In this case, his slider may have been disruptive. Hopefully, though, Thor has found a way to wield both his hammer and slider effectively. Batters beware. We hoped you liked reading The Evolution of Thor’s Hammer(s) by Eno Sarris!